He pursued the Dubai dream, but is now haunted by what he saw. I’ll never forget that Monday morning last October in Dubai. Until then, having breakfast in my 2-bed, 2-bath, 43rd floor luxury Dubai Marina apartment had never been perfect. But this morning, it was. Until then, I had been somewhat disturbed by the sight of construction workers toiling under the sizzling sun in the building right in front of mine. But on that day my peripheral vision barely noticed them. On my balcony, I instinctively focused instead on the yacht marina below me, amidst the new, beautiful architecture, that so enhanced the flavor of my cup of Colombian coffee. Before I was always aware they were there. That morning though, they sort of disappeared. They didn’t bother me anymore. The day I left Dubai for good, I thought about that Monday morning. I then understood its significance. I had been working during the past eight months in the production of a special advertising section promoting the image of the United Arab Emirates to be published in a prominent European newspaper. Of course, there was no place for the harsh reality of those construction workers in the ad section. Instead the copy was all about Dubai’s economic miracle, and the UAE as an oasis of prosperity and progress in an area of the world typically labeled by the West with exactly the opposite attributes. Despite what seemed to be obvious signs of a forced-labor pool fueling the break-neck economic growth of the small country, I learned that I turned a blind eye to them and rationalized my work as a good thing. And I wasn’t alone in that of course. Most of the international business community praises the UAE as a model for the region. So I guess that my brain managed to shut down the intuitive itching of my critical mind that told me something was deeply wrong with the place. In the end, I woke up and stepped out of the Matrix. I not only left the country for good, I also quit the country-promotion business altogether. 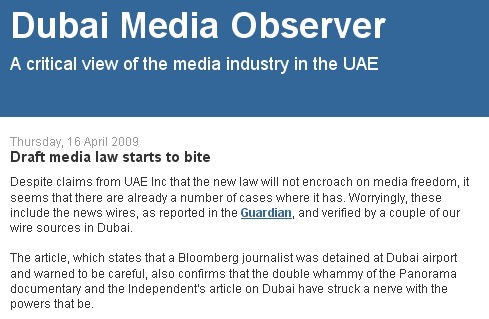 I learned something very important from the Dubai experience: the essential need for a free press! It would have reminded me of the harsh realities that accompanied the glossy material wealth of it all, such as the inhumane conditions of the workers that built the luxury skyscrapers and mammoth artificial islands. But then I probably wouldn’t have been able to stand it for eight months. Freedom of speech is the big guardian of morality not only because self-expression is a basic human right, but because it keeps people minimally grounded in reality. It reminds us about all that is wrong and ugly in the world—and also that we do have a role in our society. We do have responsibilities. I had never lived in a non-democratic country and somehow took that for granted. I wonder whether that’s why in the West we tolerate the biggest material extravagances with relative candidness. For example, if I did see Damien Hirst’s 50-million GBP diamond-encrusted skull when it was installed at Amsterdam’s Rijksmuseum—despite all the buzz and the media hype—I have access to thousands of critical voices ready to deconstruct it, and question whether it can even be called art at all. For every voice that favors the initiative, there will be at least one opposing it. But in the UAE, the state not only controls the media but also sponsors what are perhaps the most wastefully ostentatious displays of material wealth on earth. It’s as if the whole country were a mammoth, multi-billionaire, diamond-encrusted skull inhabited by a starry-eyed people ready to revel in the frivolousness of it all. But they are given no chance to express whether the whole thing makes sense at a deeper level. I leave you with this: I wonder what the foreign construction workers, toiling under the sizzling sun, living in labor camps under inhumane conditions, think about the diamond-encrusted UAE mega-skull. This is what enticed them to leave their home countries in the hope of a better life. We need to hear their voices. We desperately need to hear more of their stories in the media. So more people outside the country will see through the grand illusion created by this country’s PR machinery.